At the age of 20, as first horn in a professional orchestra, I already felt that a double horn that combined Bb and high Eb would be ideal for many passages. Many years later, when I was able to hold such a horn in my hand for the first time, I had the feeling of always having played it. The fingerings came automatically, already being in my fingers. Nevertheless, some hornists are already so used to the fingerings of the high F horn that they can’t or don’t want to change. There are also many who wish in principle to play almost everything on the double horn. I have no objection to that. Although the models with high Eb have been in my catalog for several years, it seems that many hornists still ignore their existence. Three of them are pre­sented here. One should not switch to the high Eb horn only for the reason of security. The combination with the high Eb is basically only for those who are very secure on the Bb side up to G. Because as far as the high F# and G are concerned, the horn in high Eb is not any more secure. Switching to the high Eb horn is only justified because it sounds better. In the following examples – chosen from hundreds of possible ones – we see that the high Eb horn offers advantages in all registers. Only high F# and G have other fingerings than the Bb horn! From G# on, the high Eb horn –especially with the 9th overtone-has an excellent fortissimo in no way inferior to that of the Bb horn. Tone improves because one feels completely safe to just go for it- without holding back. The use of the high Eb horn does not foster a dependence on it as is the case with the high F horn. It is not my intention in my presentation here of the Bb/high Eb horn to make anyone give up double horns, Bb/high F or triples with high F. These models in their most advanced form are, of course, also in my catalog. 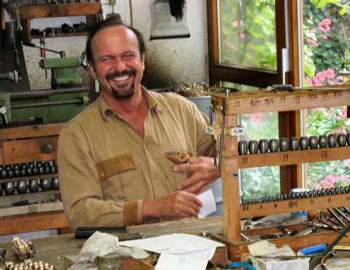 To conclude let me add that the Bb side of all models built in my shop is adjustable down a half-step to A, and – even more useful – may be raised a half-step to B natural! This means that on the B natural horn it is possible to play passages for horn in E with the fingerings for horn in Eb! For example, the Weber Concertino, the Concerto by Danzi, Fidelio, The Thieving Magpie, Cosi fan tutti, etc. with Eb horn fingerings! All of a sudden these pieces become enjoyable to play. Actually it is more logical to go up a fourth from Bb. Intonation, fingerings and sound are more alike than the combination with high F. The length of the high Eb horn makes a full length bell branch possible and the leadpipe is actually longer than that of a double horn. Three water keys are recommended. 2000 gr (4.4 lbs). Lighter than a normal double horn with stopping valve. 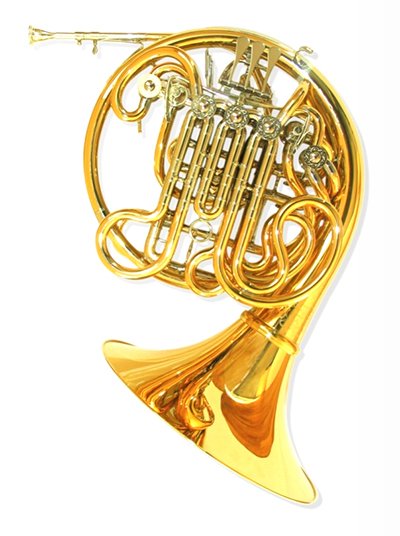 This model most closely fulfills the sound concept of the double horn player. Even the colleague next to you won’t be able to tell if you’ve played on the Bb or high Eb side. 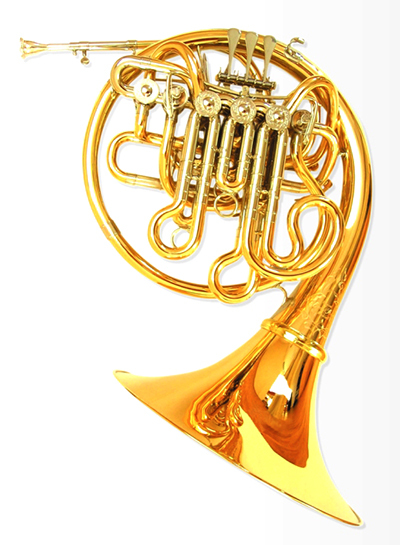 A full forte sound is possible on the high Eb horn and it gives the necessary security up into the highest range. The full low F horn is good enough even for low horn players. 3 or 4 water keys recommended. 2550 gr (5.6 lbs). Lighter than a normal double horn, the Bb side is fully comparable to that of a double horn, and the switch to high Eb without a change in sound (with the change from Bb  to high Eb [2 3], the instrument is only shortened a half step). The low F horn is surprisingly full-bodied. Because of the correct placement of the recommended four water keys, they cause no acoustical disadvantage.